Primate of Orthodox Church in America prays at Donskoy monastery before the relics of his heavenly patron. 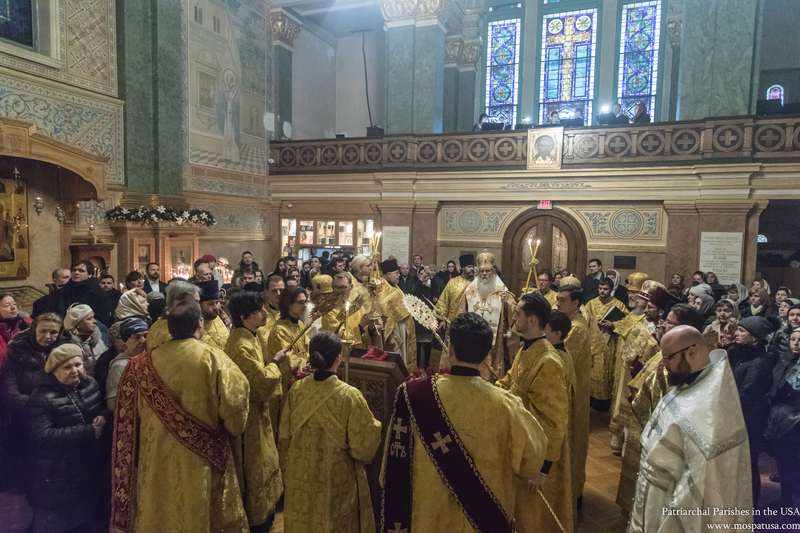 His Beatitude, Metropolitan Tikhon presided at the Divine Liturgy marking the patronal feast of New York City’s historic Saint Nicholas Patriarchal Cathedral on Wednesday, December 19, 2018. Concelebrating with Metropolitan Tikhon was Interim Administrator of the Patriarchal Parishes in the United States of America, His Grace, Bishop Matthew of Sourozh. At the conclusion of the Molieben in honor of Saint Nicholas of Myra that followed the Divine Liturgy, Bishop Matthew warmly greeted Metropolitan Tikhon, thanking him for his presence and presenting him with a jade prayer rope in commemoration of his visit. “I greet you on this the feast of Saint Nicholas, the altar feast of this great cathedral,” Metropolitan Tikhon said in response. “It is a great blessing for me to be able to be with you here today, especially since it was my predecessor and patron, Saint Tikhon of Moscow, who consecrated this cathedral. A lenten luncheon followed in the cathedral refectory, during which Metropolitan Tikhon and Bishop Matthew discussed cooperation between the Orthodox Church in America and the Patriarchal Parishes in the USA and related matters of mutual interest. 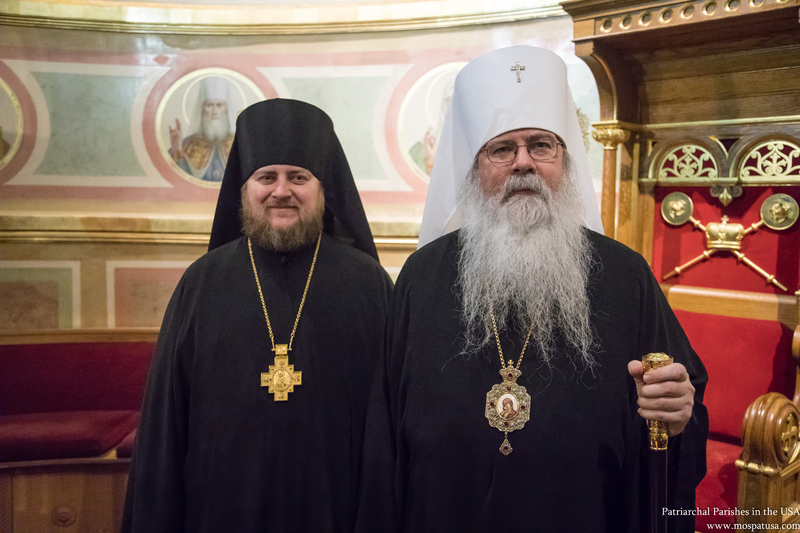 As reported earlier, Metropolitan Tikhon hosted Bishop Matthew at the OCA Chancery on November 19, 2018. Other OCA clergy who concelebrated at the Liturgy included Archpriests Eric G. Tosi and John Behr and Archdeacon Joseph Matusiak. Clergy of the Patriarchal Parishes included Archpriests Nikolai Babitjchouk, Alexey Bocharnikov, Alexander Golubov, George Konyev, and Yaroslav Lutohkin; Abbot Nicodemus [Balyasnikov]; and Priest Rodion Shamazov. 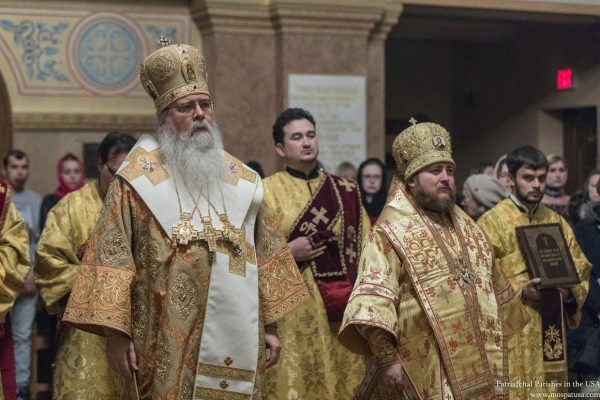 Archpriest Andrei Sommer, Senior Priest of the Russian Orthodox Church Outside of Russia’s Synodal Cathedral of the Sign, New York, NY; Priest Dmitry Nedostupenko, Secretary of the Diocese of Sourozh; and several deacons also concelebrated. Photo credit: Reader George Konyev, Media Office of the Patriarchal Parishes in the USA.